I just found a cool site http://socialmention.com where you can plug in your shop or website name and find out who has been blogging about you! 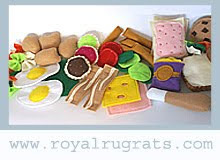 I found these special bloggers who were kind enough to include Royal Rugats in their articles. A big thank you!